When PTG advertised their Montenegro Python tour, with ZCG Cargo 644’s, against my better judgement I took the plunge and booked on a GM tour. It would have been a nice sociable weekend, randomly with Alco bashers moonlighting. The method behind my madness was as this gave an opportunity to do Albania and then head overland into Montenegro. 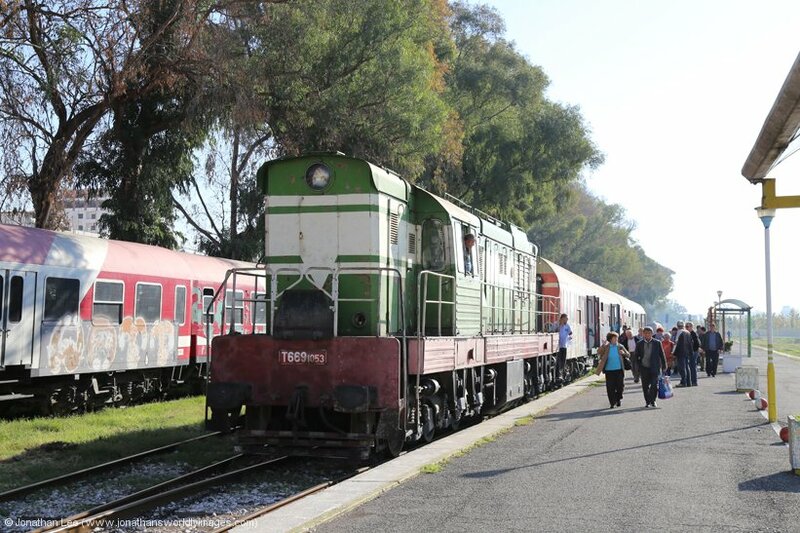 As Albania was one of my last remaining countries, with a railway, to do in Europe it seemed like a good opportunity to have a go. Coupled with the fact that HSH had only just reinstated a very limited train service, after halting all services between January & May 2017 due to their ongoing issues with fuel, the little voices in my head were telling me to get it done while the opportunity was slapping me in the face. So with a flight booked to Tirana, another back from Tivat in Montenegro after the tour and all looking good for the tour itself, everything was sorted; and then it wasn’t! Despite previous agreements being in place with ZCG for the use of 644’s on the PTG tour, a change of management had this agreement in tatters and literally out of the window. 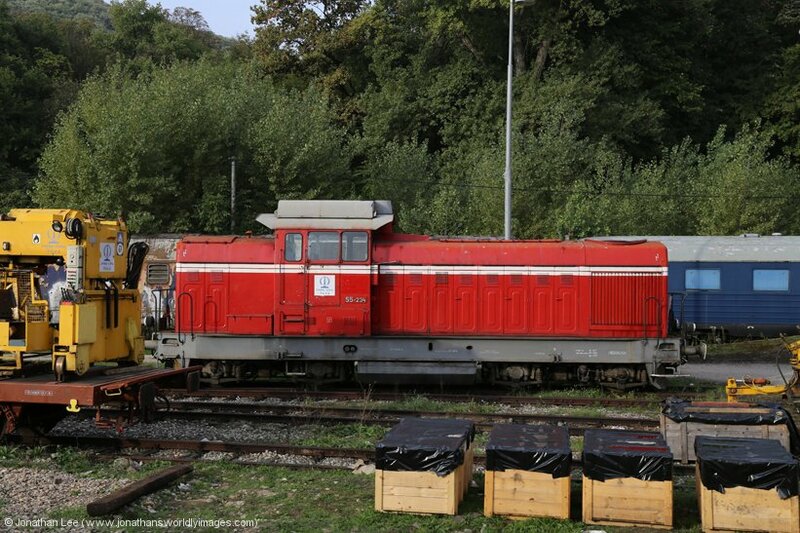 It turned out that when ZCG had purchased the locos from Slovenia the in-cab protection equipment had been removed in a bid to make the locos cheaper; and as such ZCG wouldn’t allow them to work passenger trains. It was ok however, for the 644’s to be used daily on heavy freight work! The result of this announcement was that the PTG tour would run as a private coach attached to service trains, on all the lines it was originally planned to cover and with ZCG electrics instead. 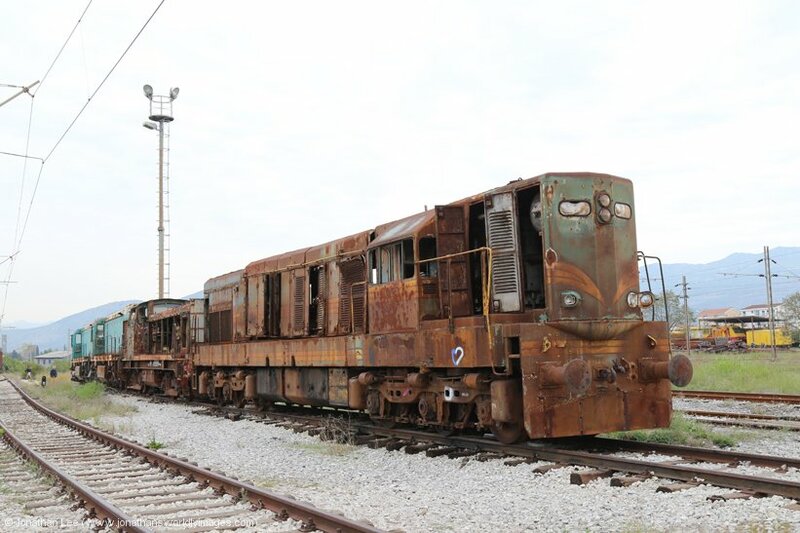 This would prevent the line to the Albanian border being covered as well, due to it being non-electrified. This put many people off, me included, and as a result I changed my plans. I was going to stay in Albania longer and fly home early from Tirana but when BA wanted £180 to do that I went on the hunt for alternative ways home. One such idea was to fly Tirana to Italy and then onwards to London, which was half the price of a direct flight with BA. However, when it was announced that the Bar – Belgrade overnight was being diverted from Pozega via Kraljevo to Lapovo, which is diesel only from Kraljevio to Lapovo, I found a flight back from Belgrade with Wizz Air for a very reasonable price; so it was game on for a cheap option home. Tirana – Best Western Premier Ark – a 2-minute walk from the airport’s front doors; out of the building, turn right and follow the pathway to the main road and the hotel is over the road on the corner by the roundabout. I was checked in quickly and had been upgraded to an executive suite for my troubles. The room was massive and completely wasted on what would turn out to be my 8-hour stay! It was pristine, had good air-con, a huge walk-through bathroom with toiletries and there were tea/coffee making facilities as well as free bottled water and excellent WiFi. The hotel’s restaurant was well frequented but was cheap and served decent sized portions of good food with attentive staff doing the serving. Shkoder – Hotel Bicaj – a short walk from the station. As it turned out I was the only person staying there. The guy in reception told me that their main clientele were immigrants that passed through in the summer months for work and that this time of year was quiet for them. There is a café attached to the place which locals used and a mini tuck-shop type place in the reception. I was given a room above the restaurant at the back of the hotel. It was basic, with a double bed, good air-con, good WiFi and a seating area with table. It was only £15 for the night so I wasn’t expecting much. As I was the only person in the hotel, I was presented with a rather large breakfast; for one person. It consisted of Burek, hard boiled eggs, fresh bread, fruit, tea and fruit juice. Albania (HSH) – all purchased at ticket offices prior to boarding. 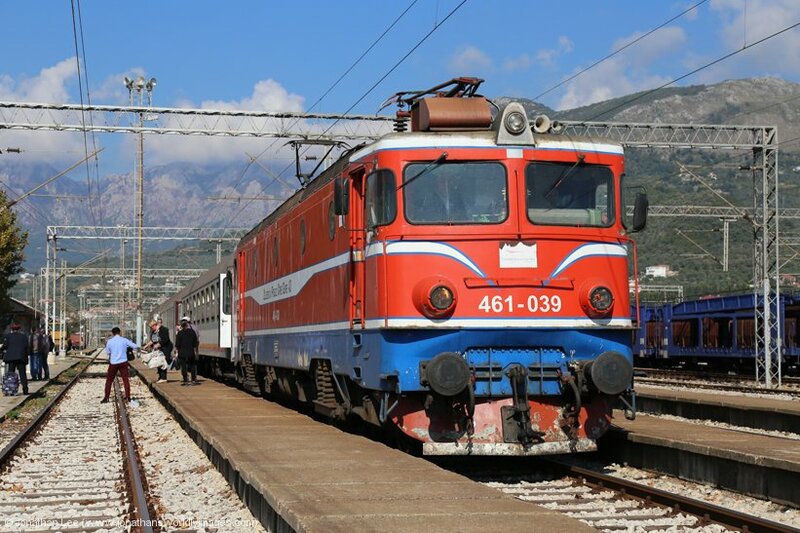 Montenegro (ZCG) – all purchased at ticket offices prior to boarding, including the tickets and berth reservation for 12432 1650 Bar – Beograd (which was easily purchased from Podgorica on the day of departure). 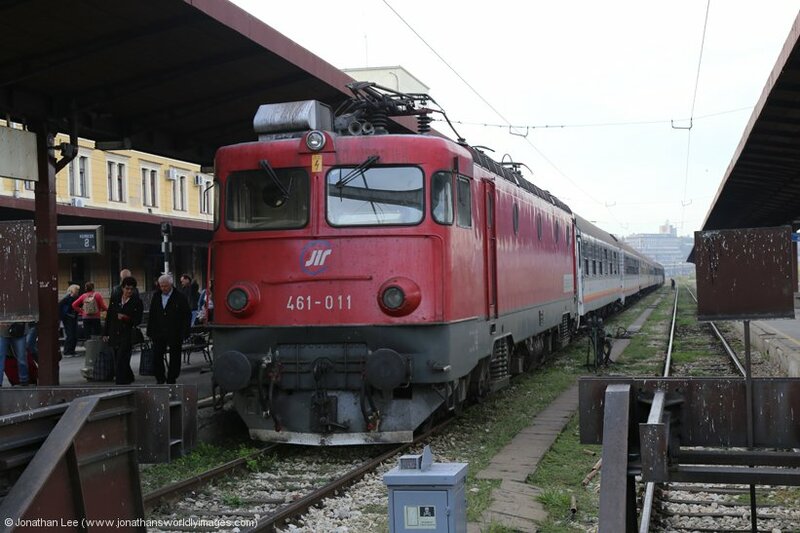 A berth in a 2-berth compartment was €20 and a ticket from Bar to Beograd was €18.90. Serbia (ZS) – all purchased at ticket offices prior to boarding. Not much to say about the journey to Tirana, 91127 to Kings Cross on 1Y82 1003 York – Kings Cross, which gave me a plus 4 to get from Kings Cross to platform A at St Pancras Low Level; and nearly killed me in the process. It took the whole, very slow, journey to Gatwick to recover on the nice shiny new Class 700 EMU, which I have to say are quite good for new build rubbish. My British Airways flight was on time and full. I was definitely the odd one out on board, yet on arrival at Tirana half of the plane went to the Albanian immigration desks and half to the foreigner immigration desk. I found it a little strange that there was no passport stamp to enter Albania but after a couple of questions I was just waved through. Airside there was a money changing place, which changed offered 147 ALL (Albanian Lek) to the 1 GBP. I changed £20 for the 36 hours I was intending to be in the country and it was more than enough, £15 would have more than covered it! As I was arriving into Tirana after 2000 I took the easy option and booked the Best Western Premier Ark Hotel, which is a 2-minute walk from the airport’s front doors; out of the building, turn right and follow the pathway to the main road and the hotel is over the road on the corner by the roundabout. I was checked in quickly and had been upgraded to an executive suite for my troubles. The room was massive and completely wasted on what would turn out to be my 8-hour stay! It was pristine, had good air-con, a huge walk-through bathroom with toiletries and there were tea/coffee making facilities as well as free bottled water and excellent WiFi. The hotel’s restaurant was well frequented but was cheap and served decent sized portions of good food with attentive staff doing the serving. I wasn’t late out of bed and had an earlier than planned start thanks to the badly timed hotel shuttles, for what I needed. Still, with a taxi being €15 from the hotel to Kashar Railway station and the hotel offering the same journey in their shuttle car for €8, there wasn’t really a choice to make; and I went to bed with an alarm set for 0500 to do the 0545 shuttle from the hotel. I didn’t sleep very well in my huge room but the hot shower woke me before I headed down for breakfast. Unlike the food the previous night, breakfast left a little to be desired and looked to have been laying around for a while; with the member of staff on duty being woke by the receptionist when I walked in! The cheese & meat looked hard and was curled up on the edges, so I settled for a bowl of cereal and a cuppa. After paying I was escorted out of the hotel, to my waiting car; which, needless to say, was a Merc! 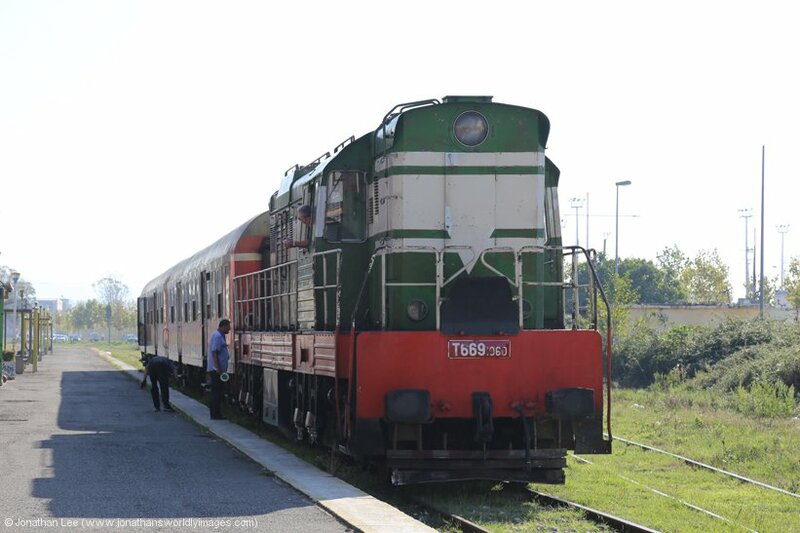 It turned out that the driver had been on duty all night and was now driving the car to Tirana to go home, it would then be driven back to the hotel by a member of the day shift staff and then used as the shuttle car between the hotel & Tirana all day. My driver, according to him, used to work for the national airline at Tirana Airport, before the company went bust. He had previously been an engineer working on planes and was now a lowly shuttle driver as there wasn’t the work in Albania these days. His family all worked as plane cleaners at the airport so their 4 wages was enough to get by on he told me. 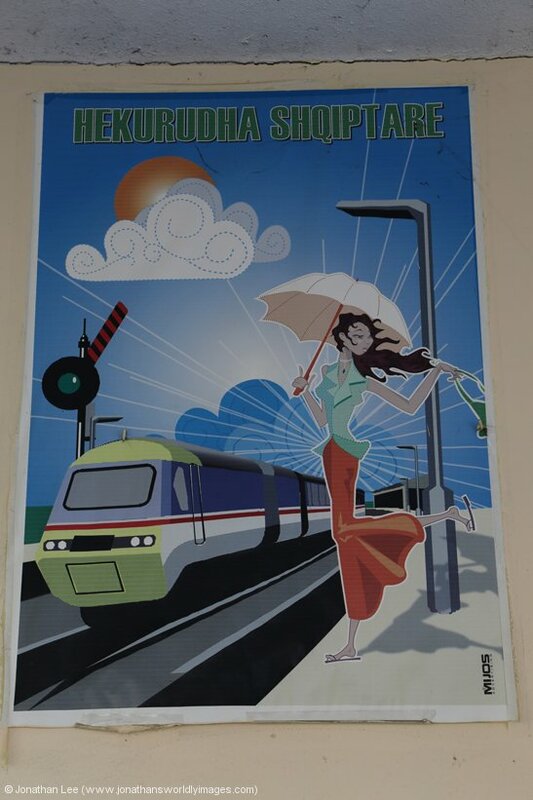 Kashar station is 7km from Tirana itself and isn’t signposted at all. After the driver stopped to ask for directions I figured he needed a bit of guidance and ME Maps got us to the station, no problem. It’s set back from the main road, behind some buildings. Before I let my driver head off, I confirmed that there was a loco attached to the two graffiti covered coaches in the platform, which there was. After he disappeared up the driveway I assessed where I was, a station in the middle of nowhere with only industrial buildings around it. There is a station building, which was manned and as I walked up the platform to see what the loco was at the head of the train the two occupants came out onto the platform to see what I was up to, but didn’t ask anything after I’d discovered HSH’s T669-1047 at the head of the train. It was still dark, only just after 0600 and daylight was just trying to creep over the mountains that lined the horizon at the other side of Tirana. It wasn’t that warm either and as I walked about to keep warm, I noticed the two ex DB coaches had windows missing in the vestibule doors, were almost completely graffiti’d from top to bottom and had all sorts of cracks and holes in the windows; caused by stone throwing. To say the stock was looking dire was an understatement. The loco, on the other hand, was almost completely free of graffiti but for a little bit on the front buffer beam and all its windows were present and intact; although they were lined with cardboard, to possibly stop the stones shattering the glass? The station building, or porta cabin as it actually was, had a full price list for tickets on the side of it, along with a board to confirm it was Kashar but the one fundamental but of advertising missing was indeed a list of train departures! 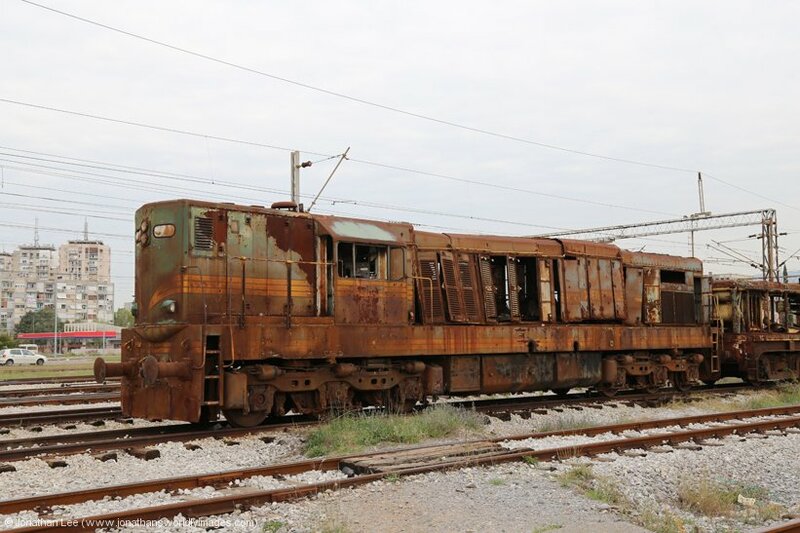 Since the service had started running again in May 2017, Seat61 had advertised what was allegedly running and there had even been a proper HSH PDF timetable produced and posted on the Fahrplanceter website; unfortunately there were differences with the services advertised on the Durres – Elbasan line. 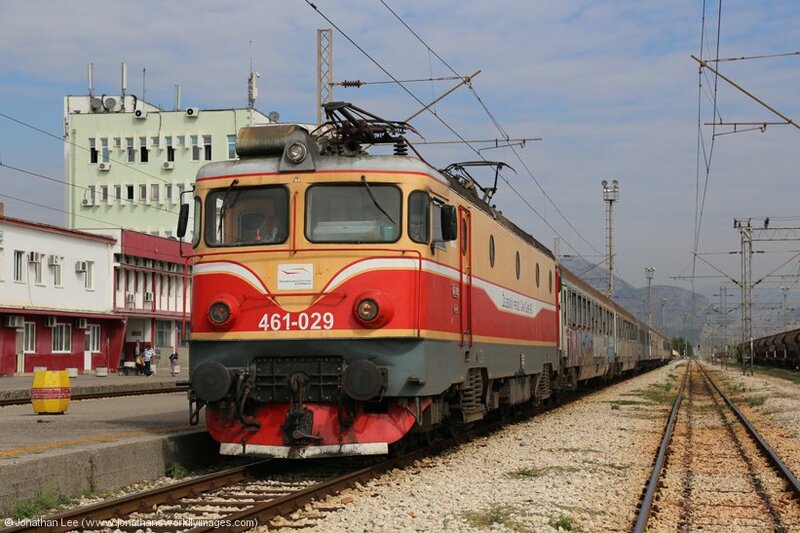 Seat61 was showing a daily Elbasan – Durres – Elbasan service but Fahrplancenter was showing the train running Rrogozhine – Elbasan – Rrogozhine, with no service Rrogozhine – Durres at all. 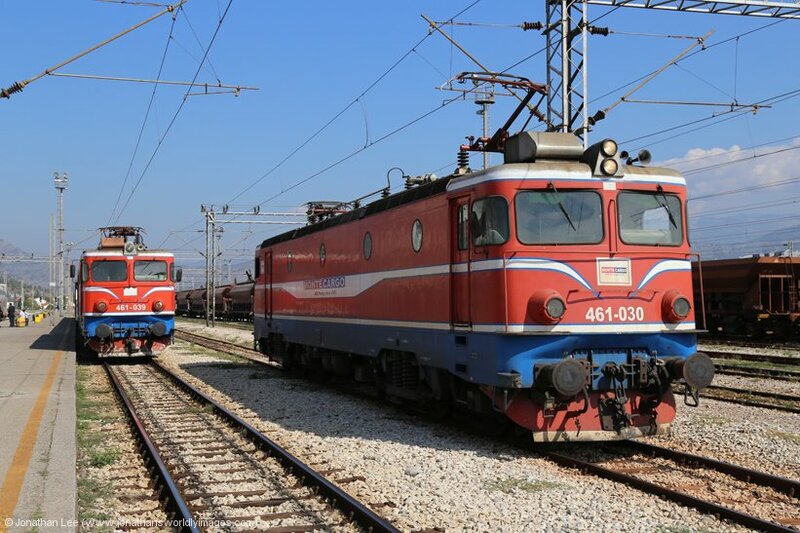 The one thing both websites agreed on was the service between Kashar & Durres, with services departing from Kashar at 0700 & 0830 and from Durres at 0710 & 1430. As daylight broke, and the time drew closer to 7 o’clock, I expected a few more people to turn up for the first train. Nothing of the sort happened though and while some guy, who attached his bike to the loco handrails, seemed to be preparing the loco for departure there wasn’t much going off at the station building. Just after 0700 a bus hammered into the station car park, which I thought might have been why the train hadn’t departed right time, but only 4 people got off, two walked over the tracks and into the industrial place there, while the other two walked into the booking office and opened up to sell tickets. 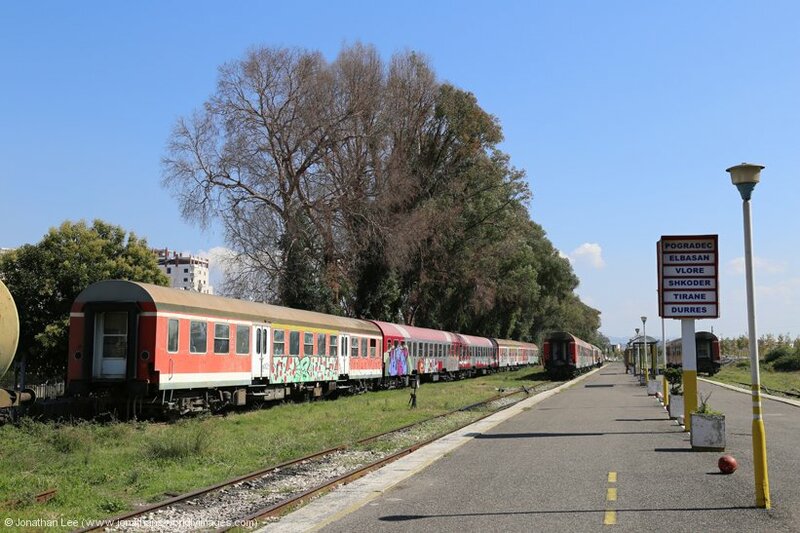 I bought a single from Kashsar to Durres for 70 Leke, even though I was planning to get off at Vore to do the 0710 Durres – Kashar back and then head back to Vore on the 0830 from Kashar to do the 0545 Shkoder – Durres into Durres. It turned out to be the correct ticket to buy in the end. There was no hurry to get the 0700 service away from Kashar and it wasn’t until 0725 that T669-1047 was started. At 0730 the train departed. I was surprised that the T669 was unsilenced and it sounded quite meaty, my intrigue was short-lived though as after the loco, being driven on half power, had got the train to about 30-40mph, it was shut down and the train coasted along until the loco needed starting back up to gain a bit more speed. This practice occurred on every train I did during the day, the fuel crisis clearly not having gone away! 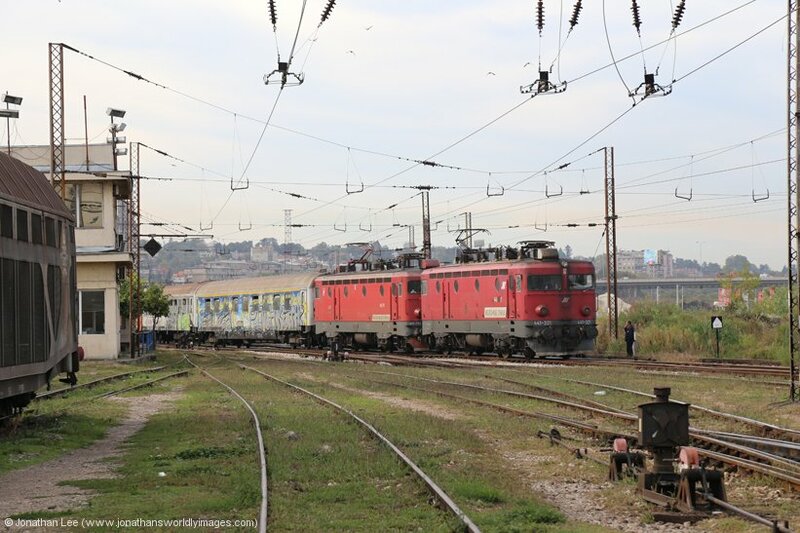 At Vore, T669-1048 was already sat in with the 0710 Durres – Kashar and thanks to the offside doors being locked it was on the move before I managed to get off through the one set of doors being used on the set. 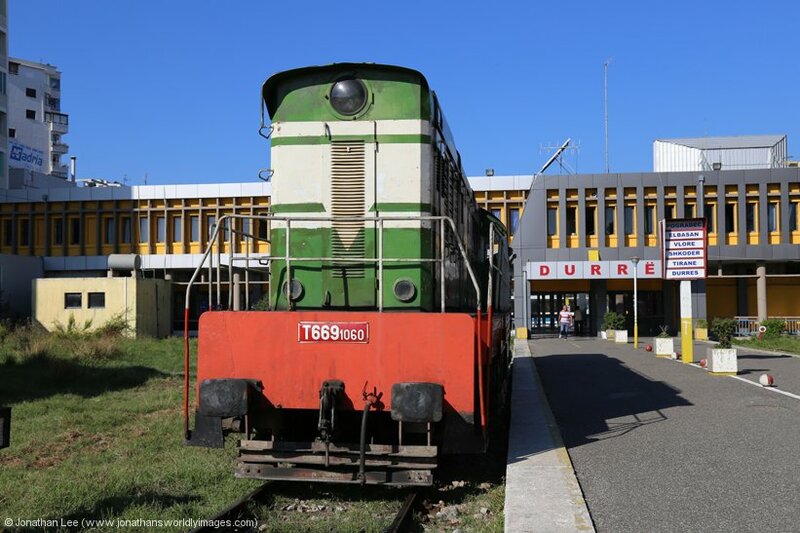 The staff were then all a little confused when I got back on and continued to Durres; just as they had been when I tried to get off anyway, with my ticket for Durres! 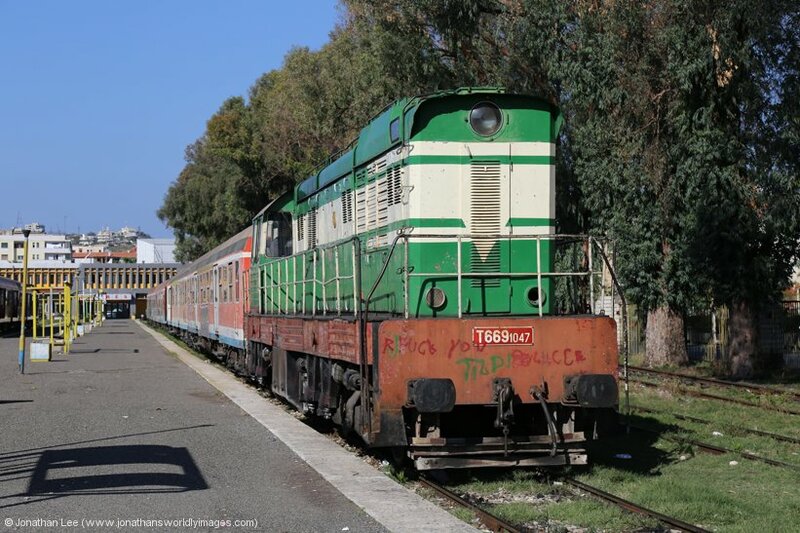 Rather than get off at Vore and wait for ‘1048 to return from Kashar I figured I’d head through to Durres and find out if the 0610 Elbasan –Durres did run and then try and ned it in from Shkozet, the first shack outside Durres; where the HSH loco depot is. At Durres ‘1047 was detached almost immediately and run around, it then shunted the stock clear of the platform. 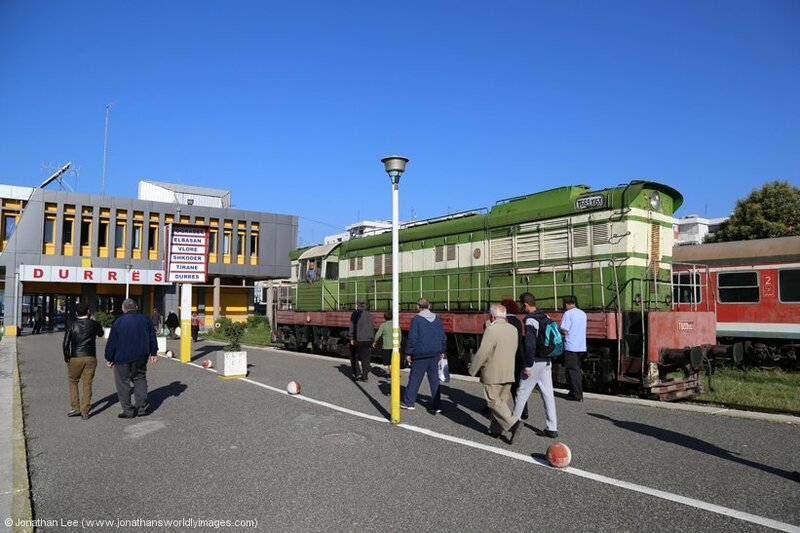 Once the shunter had finished I asked about the Elbasan arrival and he confirmed it would arrive at 0900 by pointing at his watch; he spoke no English at all. With that info I walked the 2km back to Shkozet shack, which took about 20 minutes at a good pace. 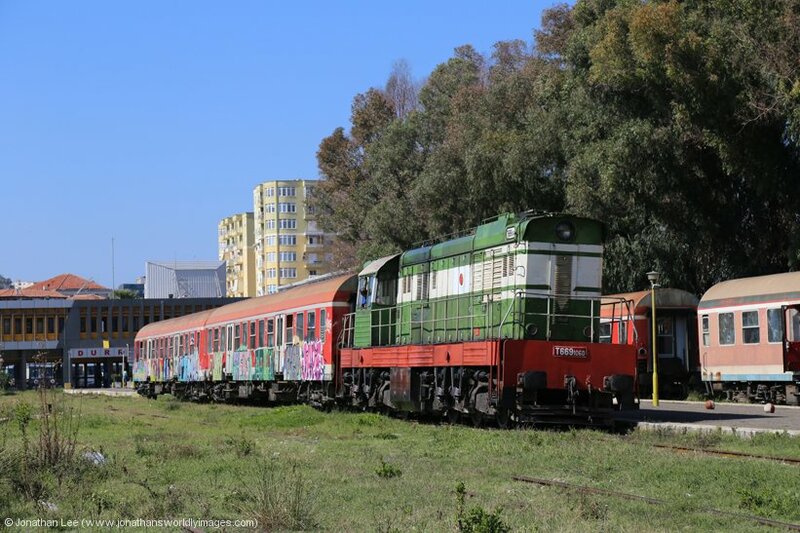 I had every intention of trying to walk to the shed and photograph everything but as I arrived T669-1053 was on the approach with the 0610 Elbasan – Durres and another two ex DB coaches, graffiti’d and with broken windows. 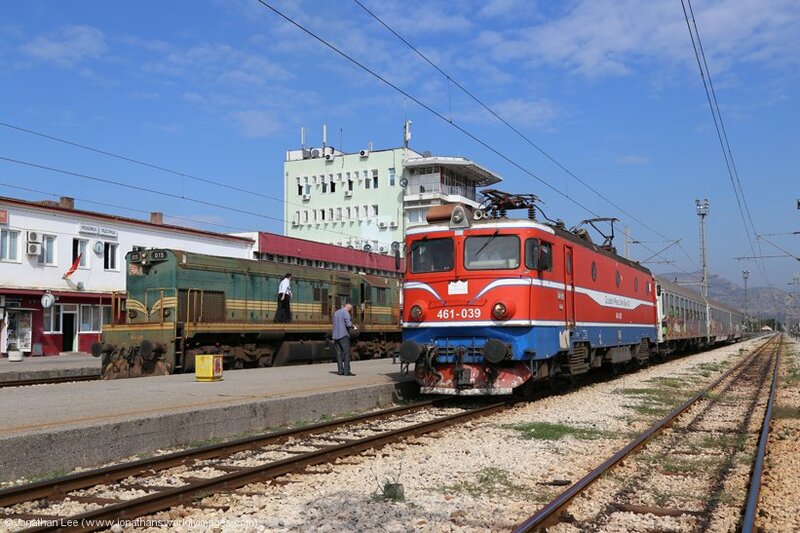 The staff on the train wanted to see my ticket and the Kashar – Durres one I already had sufficed for the short journey into Durres; where the train arrived almost 10 minutes early. 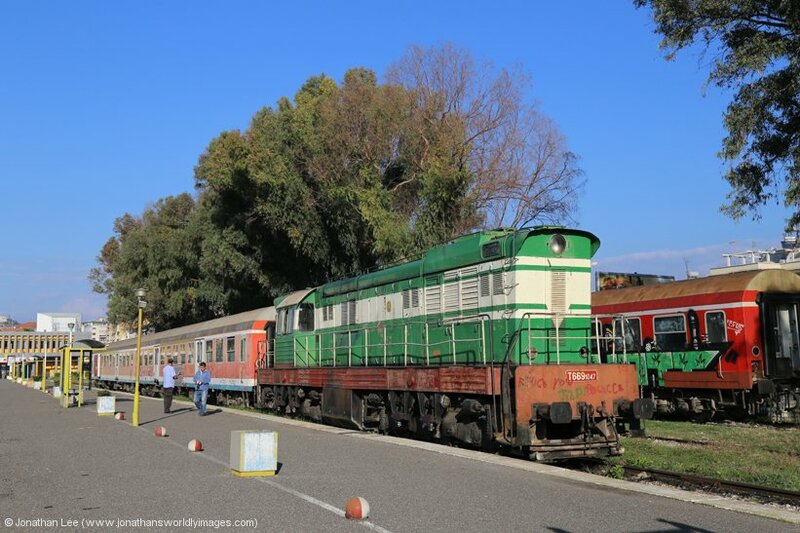 Unlike the previous train I’d done from Kashar, which had 7 people on board, only 4 of which were fare-paying passengers, the Elbasan was quite well loaded in both coaches. I had chance for a quick photo of ‘1053 at Durres before hotfooting it back towards Shkozet, hot on the heels of the loco, which ran straight to shed. 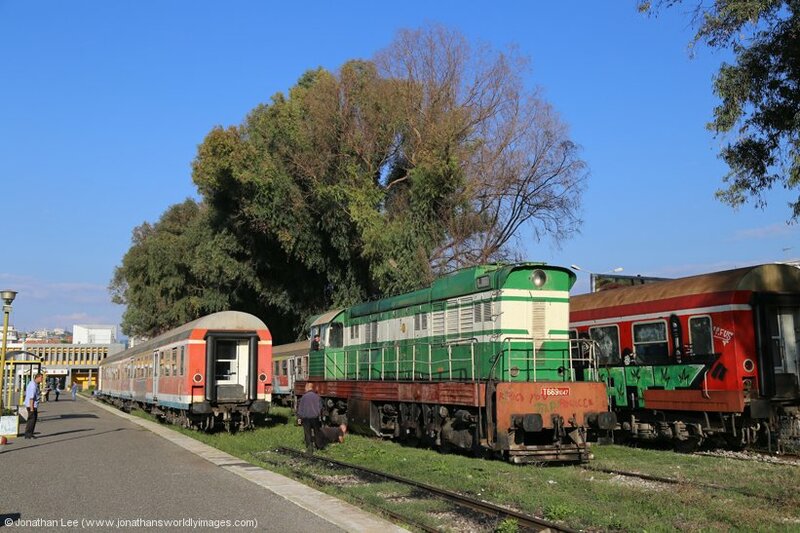 The Elbasan arriving early into Durres did me a favour, not that I knew it until later that afternoon, but I narrowly made T669-1048 at Skhozet; returning from Kashar with the 0830 Kashar – Durres. 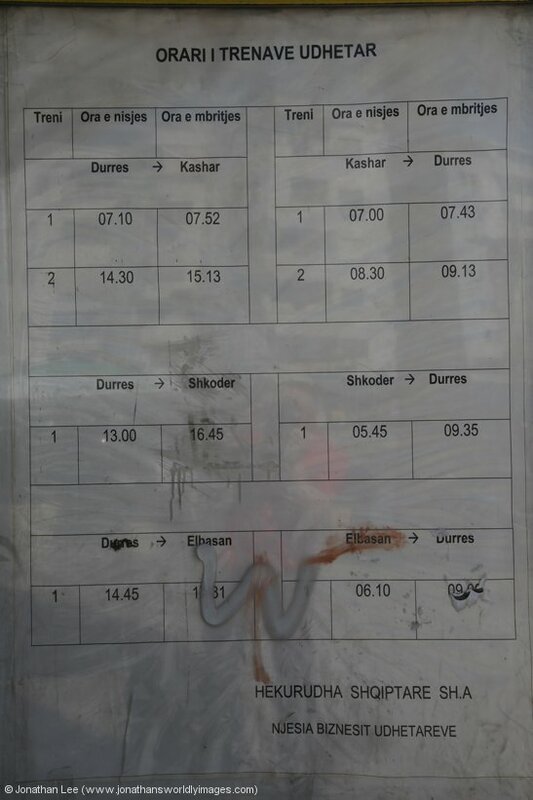 My Kashar – Durres ticket again sufficed for the short journey into Durres. 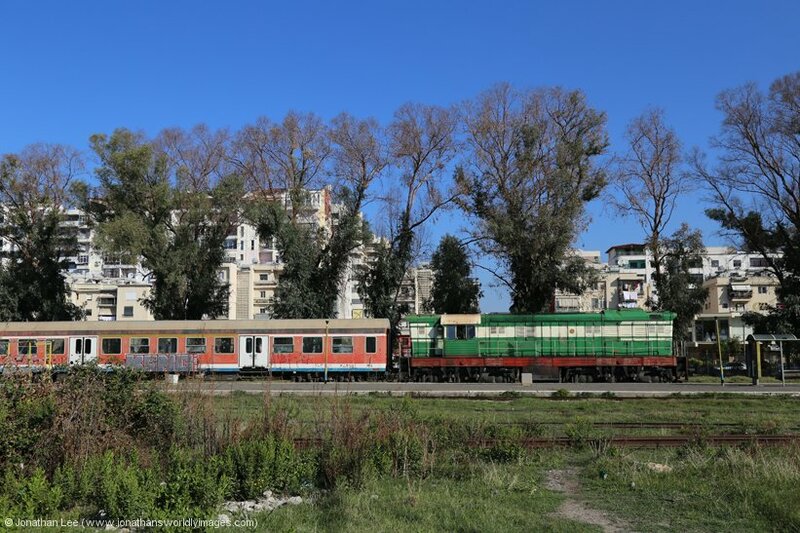 Upon arrival the loco disappeared to shed and soon afterwards T669-1060 arrived with the 0545 Shkoder – Durres and went straight to shed itself. 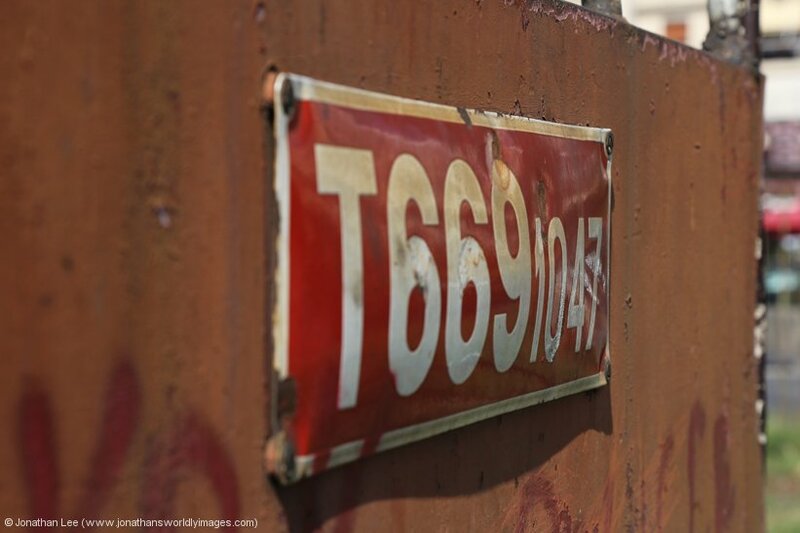 T669-1047 shunted its coaches back into the station and that was the excitement over for the morning. Outside the station front is a large bus station where all I could hear was people shouting out the destination of their buses, most of which were heading to Tirana. Along one side of the bus station it is completely lined with tour companies, all advertising pretty much the same thing with most offering trips to nearby Italy as their mainstay. There were plenty of cafes in the vicinity as well but I left these behind and went to find Durres Castle. I was quite surprised to find the remains of the castle had been turned into a café itself and that the odd bit of wall was visible in the undergrowth around it. Durres itself was quite a busy place, away from the station area, and there was no shortage of places to eat. I found a pizza place that opened at 11 o’clock and had a decent pizza and drink for under a fiver; before heading back to the station. The booking office was open when I got back and the woman manning it was sat in the foyer, knitting and with a crossword book on the adjacent seat! My ticket to Shkoder was 160 Leke. The sets of stock in the station, all load-2 rakes, were left in situ to form the opposing working back out to that which they’d arrived on. 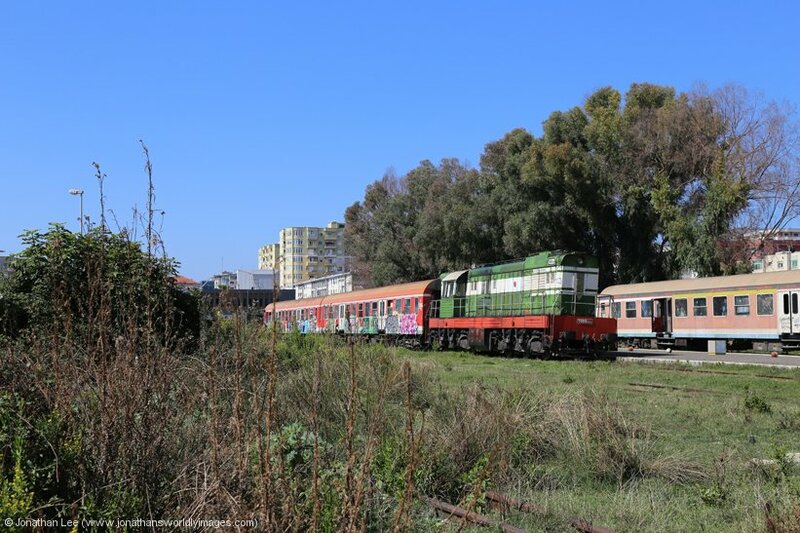 T669-1047 remained attached to its set for the 1430 Durres – Kashar all morning. 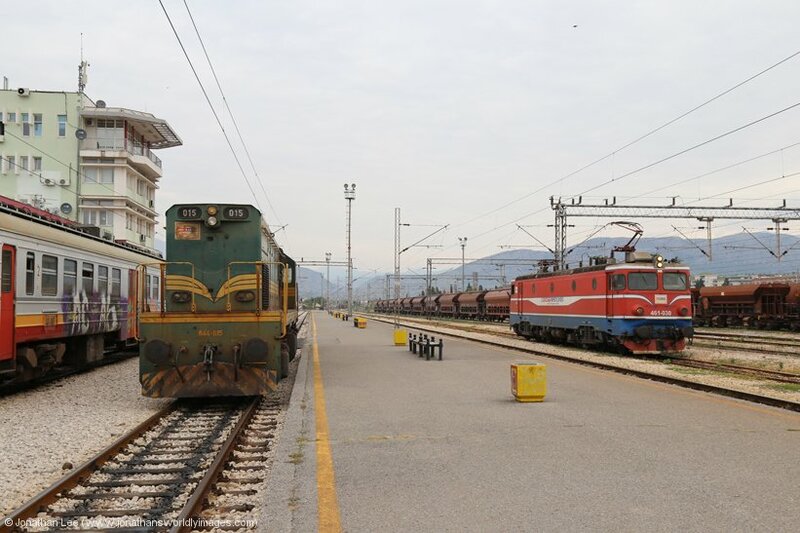 T669-1060 turned up and coasted onto its rake half an hour before the 1300 Durres – Shkoder was due away and as we paused at Shkozet T669-1053 was sat running in the headshunt there; which I assumed was going to run back into Durres for the 1445 Durres – Elbasan. 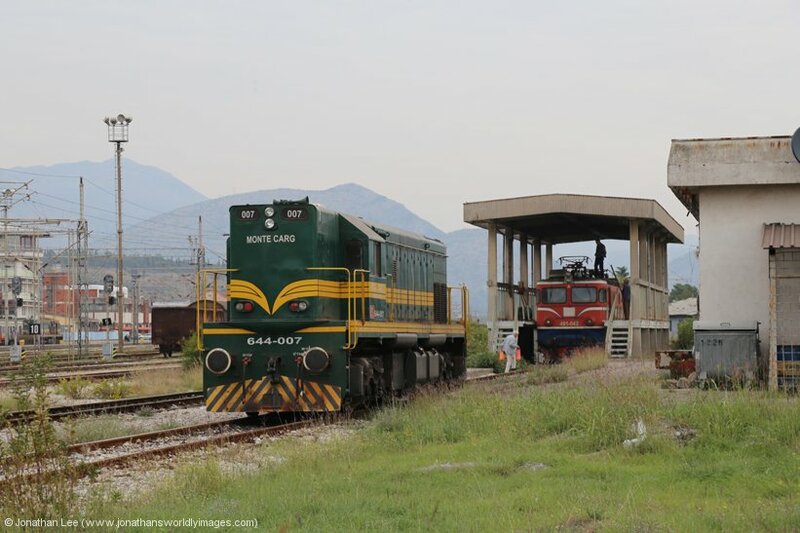 As we departed Shkozet on the Vore/Kashar line, T669-1061 came off the Elbasan line with a decent length freight and on shed at least 3 of the T669’s were running, which included ‘1048 & ‘1044. The 1300 Durres – Shkoder wasn’t that well loaded out of Durres and there were 5 tourists on board, including myself. Part way down the line the train got plenty full but everyone had got off again well before Shkoder. I got talking to a couple of female German tourists along the way, one of which ended up spending most of her journey in the cab with the crew; and by the time she got off at Shkoder she was quite well pissed, along with at least one of the train crew, who wanted to give them a lift to the hotel in his car, which he drew up to the side of the loco after it had run round! I ended up walking out of the station with them so they didn’t get hassled any more. The journey from Durres took less than the advertised 3h45m and we were a good 10’ early arriving into Shkoder. The scenery along the way isn’t spectacular but it’s a nice journey and there are some things to look at while you’re minding your own business; as long as you can find a window that is either not smashed, or comes down so you can at least stand to look out along the way. Despite the knackered appearance that the outside of the stock gives, it’s perfectly habitable inside and the toilets are pristine, even if they don’t have bog seats on them. The staff do try to keep their sets clean and the floors were being mopped before we even reached Shkoder. My hotel of choice was the Hotel Bicaj as it was a short walk from the station. As it turned out I was the only person staying there. The guy in reception told me that their main clientele were immigrants that passed through in the summer months for work and that this time of year was quiet for them. There is a café attached to the place which locals used and a mini tuck-shop type place in the reception. I was given a room above the restaurant at the back of the hotel. It was basic, with a double bed, good air-con, good WiFi and a seating area with table. It was only £15 for the night so I wasn’t expecting much. The following day I would be heading to Montenegro by road, with the road journey from Shkoder in Albania, to Podgorica in Montenegro, only taking about 90 minutes. There were bus options that would require most of the day but as I needed to get there and make sure I made the Bar – Belgrade overnight that afternoon, I’d already e-mailed the hotel in advance about road transport possibilities and on arrival at the hotel asked if they could arrange me a taxi for 0800 the following morning. Wary of taxi companies hiking up the price I made sure the guy knew that €40 seemed to be the going rate for the journey then headed upstairs for him to do his stuff. When I headed back down to see what he’d sorted, he told me that the three taxi companies he’d tried had indeed quoted €40 “but” his mate, who worked at the hotel, would take me for €35. Said mate was present at the hotel working his afternoon shift and I was happy with the deal so we sorted the arrangements before I headed out to find something to eat. 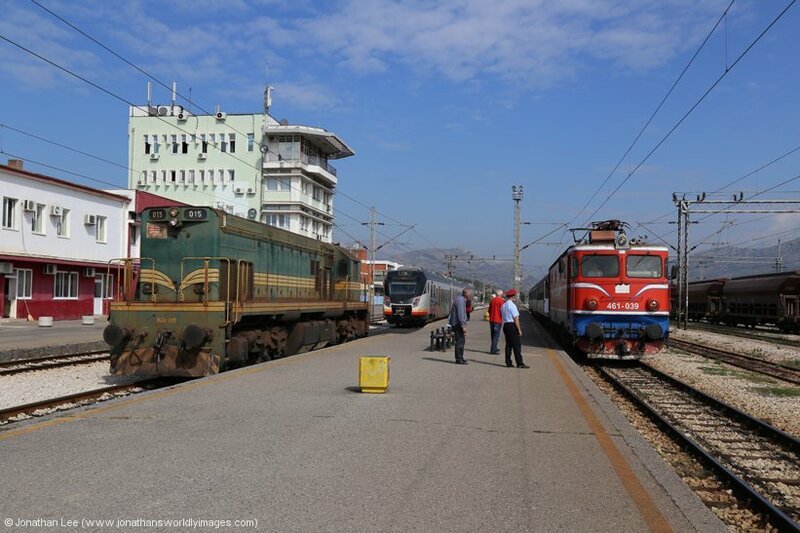 The town centre at Shkoder is a 15-minute walk from the railway station and Hotel Bicaj. I was quite surprised at how un-Albanian it was with its bustling main drag lined with bars and restaurants, along with outdoor eating areas down the centre of the pedestrian walking areas. For the second time that day I settled for pizza, mainly as places didn’t seem to be fully open until after 7pm and I was hungry and tired and just wanted to get to bed after the early start. After a second good pizza of the day I was in bed before 9pm; pushing out the z’s. As I was the only person in the hotel, I was presented with a rather large breakfast; for one person. It consisted of Burek, hard boiled eggs, fresh bread, fruit, tea and fruit juice. I could barely manage the eggs and a bit of bread after stuffing myself with pizzas the previous day and felt a little guilty leaving most of what I was given. After a refreshing shower, which pretty much flooded the bathroom, and was spilling out into the room as I left, I waited downstairs for my ride to turn up. He was a little later than the 0800 agreed time but wasted no time in getting us on the road towards the Albanian/Montenegrin border. 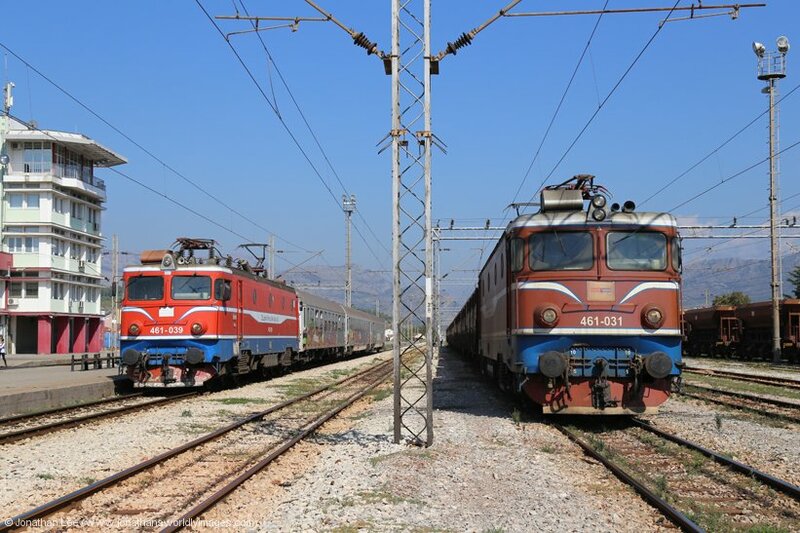 The road from Shkoder to Hani I Hotit is single carriage way all the way but as it wasn’t that well used there was opportunity to overtake the slow movers and we were in the queue to exit Albania by 0845. It wasn’t a very well-organized queue either, with lorries lining both sides of the road on the approach and then there was no real management of the traffic approaching the checkpoints; with Albanian border staff seemingly arguing amongst themselves amid the chaos. Once we’d exited Albania, no-mans-land was even more of a farce with lorries cluttering up all the roadside and more on the way towards the Montenegrin entry checkpoint. This resulted in a queue of cars going around them and then blocking the road towards the Albanian checkpoint completely; and at one point, it was gridlocked until things started to move on the Montenegrin side! It took 30 minutes from arriving at the Albanian checkpoint to being on the move at the other side of the Montenegrin checkpoint. My driver told me that it was very unusual for it to be that busy and it usually takes less than 10 minutes to get through the lot. 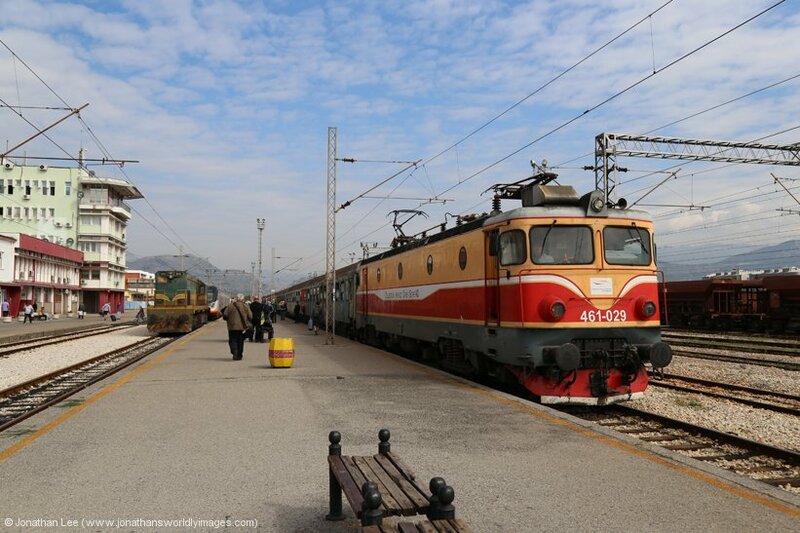 With the journey on the Montenegrin side only taking about 20 minutes to Podgorica station, I was standing on the platform at 0935, 90 minutes after leaving the hotel in Shkoder. I had to direct the driver to Podgorica station with ME Maps as he’d never been there before but it was easy. I paid him with €30 and what I had left in Albanian Leke, which was probably about €7; and he was on his way back moments later. First things first on arrival into Montenegro, and that was to ensure I had a sleeper berth & ticket for train 12432 1650 Bar – Beograd for later in the evening. I picked the young girl in the ticket office as I assumed she’d speak decent English but she spoke none at all and the older woman came over to sort things out. Once they realized exactly what I wanted, I was presented with a price for the berth and fare separately and once I confirmed I was happy with it they then had to get on the phone to confirm space was available; before finally writing out the tickets manually. I ended up with exactly what I asked for, which was two Bar – Beograd tickets and both berths in a 2-berth compartment, for myself & Nige Pearson; who be landing in Montenegro in about an hour’s time! The tickets cost €18.90 each and each berth was €20. On top of that I bought a single from Podgorica to Bar for €2.40; yet randomly Nige managed to get his for €2! 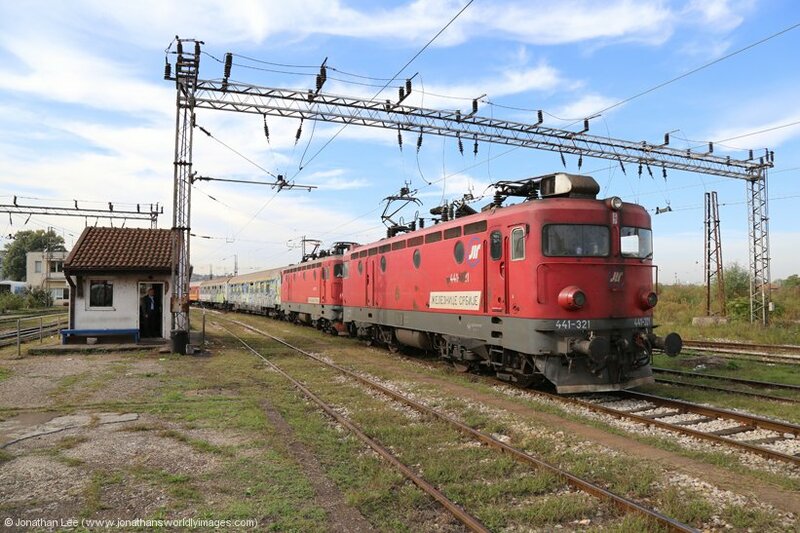 I had about 45 minutes to kill at Podgorica before 12433 1817 (P) Beograd – Bar was due, so had a walk over the tracks and pointed my camera at whatever I could find on shed over the way. ZCG 644015 was in the station, shut down, 644007 was on shed, shut down and 644013 was inside the shed being worked on; and eventually moved out before I left Podgroica. ZCG Cargo 461030 was shunted off shed to stand in the station yard to work a freight and Cargo 461042 was inside an external shed with staff clambering all over it, which I assumed was a routine exam. The demic line outside the front of the shed had been drastically reduced since my previous visit and was down to just four locos, all ex JZ – 661273, 642174, 744005 & 744006. Randomly, staff were clambering on 744006 with drills and a host of other tools. 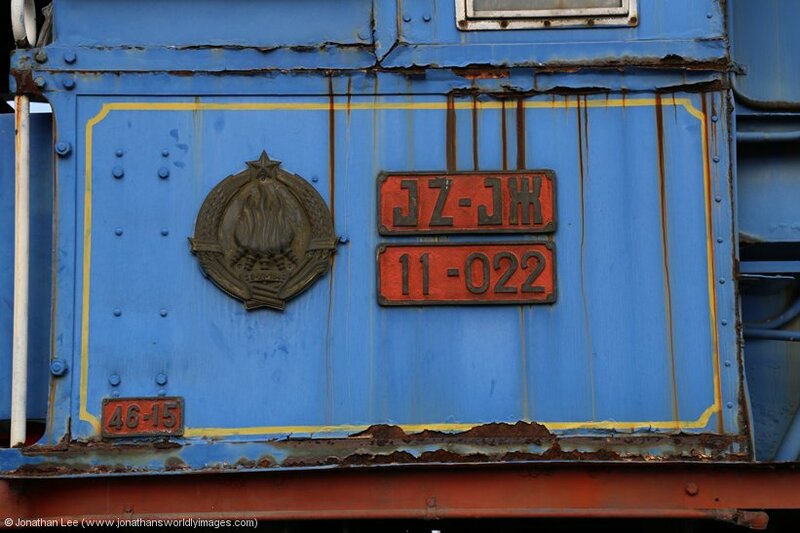 I eventually figured out they were removing all the works plates and JZ plates from the loco. It looked like they were having problems with the last JZ plate on the cab door and a bigger drill bit was required. Other than that plate, both the 744’s had no plates at all left on them but the 642 did still have a couple. While I didn’t venture down, the Bar end of the shed had a few more demic 642/661 types but I didn’t have the time to wonder down; although the Beograd overnight did turn up late and I could have walked down after all. Even those flying in for the PTG tour, or not tour, with Ryan Air were wondering around Podgorica station before dud 461029 turned up with 12433 from Beograd. 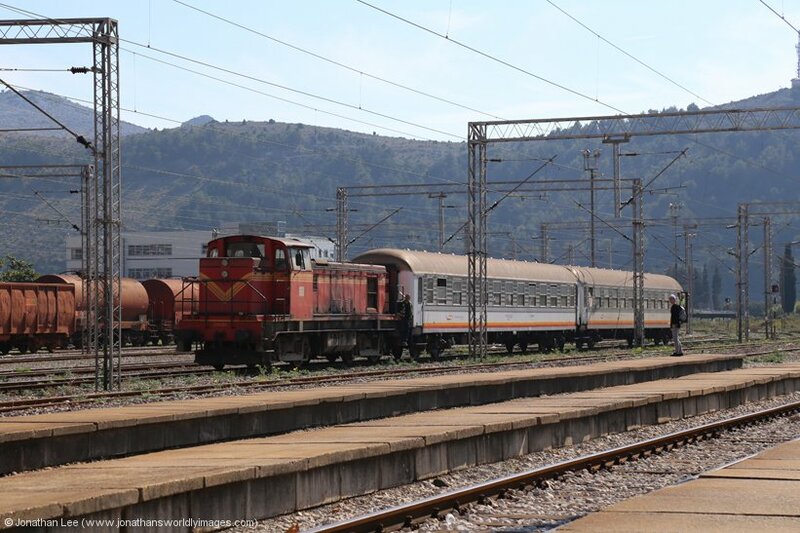 Which was duly flagged and 461039 was rolling in with 6103 0930 Bijelo Polje – Bar shortly afterwards, which is booked to stand at Podgorica for an hour so there was no rush to board. 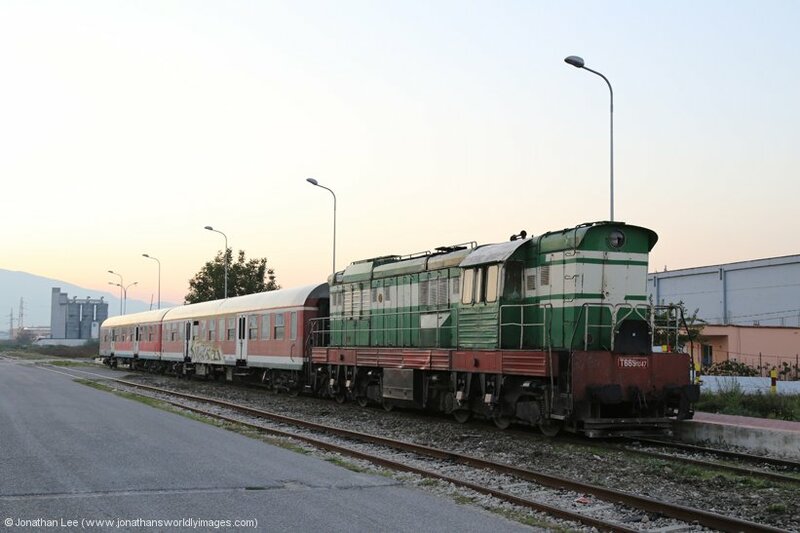 With only a few cranks having doe the Beograd overnight towards Bar, 6103 was pretty full of cranks when it departed Podgorica. 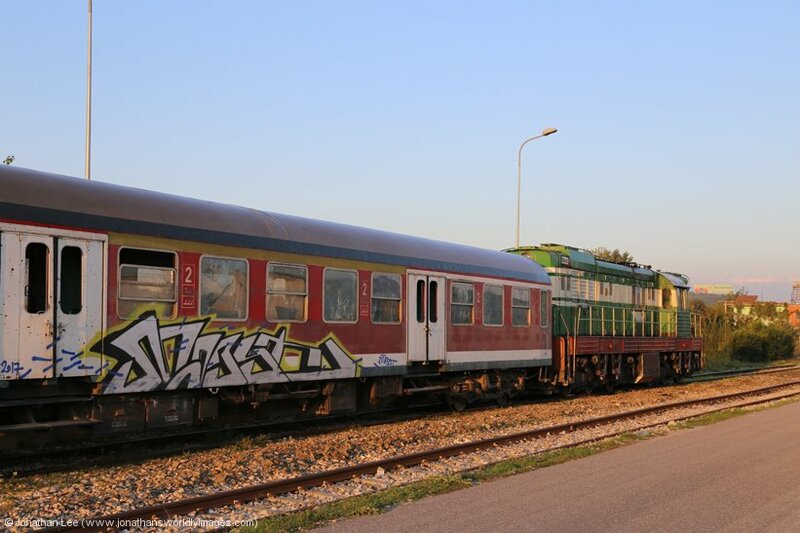 Some got off at Sutomore and the majority that went through to Bar returned to Sutomore on 6102 1505 Bar – Bijelo Polje to do the Bar – Beograd overnight back to Podgorica later. Uncle Flossy was sat waiting for us at Bar, having flown into Tivat with Easy Jet and then got himself a taxi direct to Bar from the airport; mainly as he couldn’t be arsed becoming a peasant and using buses to get to Podgorica. Apparently, I led him astray during the afternoon, in the two bars we visited near the station. The one over the road to the left was very c heap for beer but didn’t have a lot of food on offer but the wooden place, out of the station on the right, served up good food but the beers were almost three times the price they had been at the other place. Some cheap cans of beer, for the kiosk on the station, were purchased for the train and we managed to get the coach attendant to let Flossy travel with us in our 2-berth compo. 12432 1650 Bar – Beograd had ZCG 461041 at its helm and behind the loco were the ZCG sleeper coaches and couchettes; which would be handy for us during the night when the loco change took place at Kraljevo. 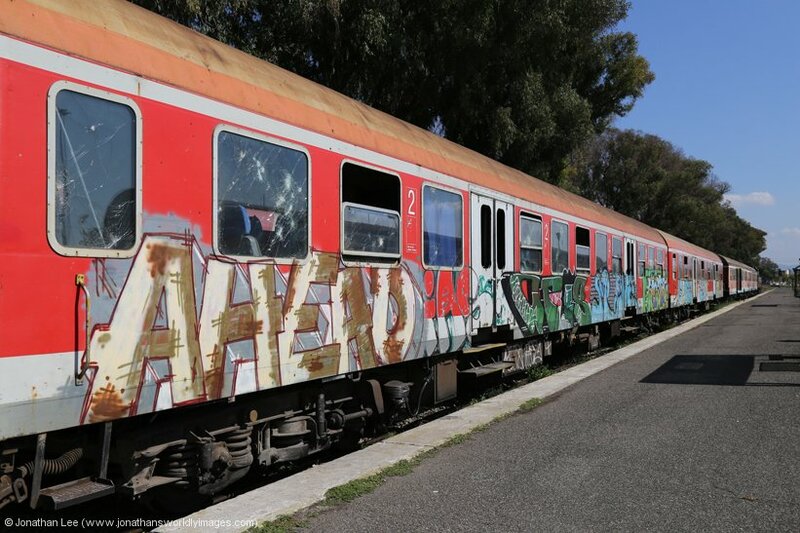 Travelling conditions looked to get worse towards the rear of the train, where the ZS day coaches were, all of which were heavily graffiti’d. The journey towards Podgorica was long enough to allow our beer to be consumed and the coach attendant was quite forceful in making sure Flossy got off, to the point where I was convinced he was going to come and drag him down the coach. 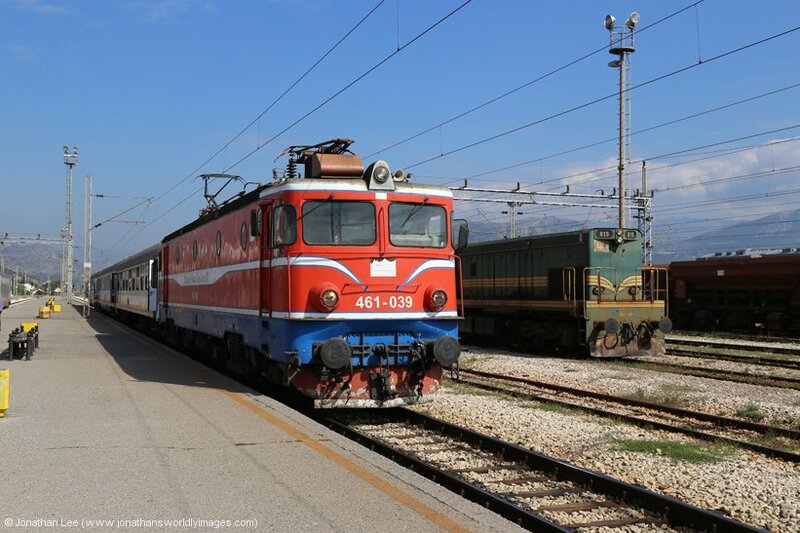 After we left Podgorica, it was a nice run thorugh the mountains towards Bijelo Polje and the Montenegrin passport grip occurred while ZCG’s 461041 was removed from the train and replaced by ZS’s 441753; which had conveniently been stood right outside our compo window. The passport grip was as harmless as they come and we were soon pottering over the border into Serbia and going through the same rigmarole at Prijepolje teretna; which was equally as harmless, even if the woman doing the checks did halt and glare at the page in my passport that had Kosovo stamps on it. Bed followed soon after the passport grip and the berths were quite large and comfy. The next time I woke was to hear Nige telling me “it” was ‘001 that was sat outside the compo window yinging away; and basically keeping me awake. 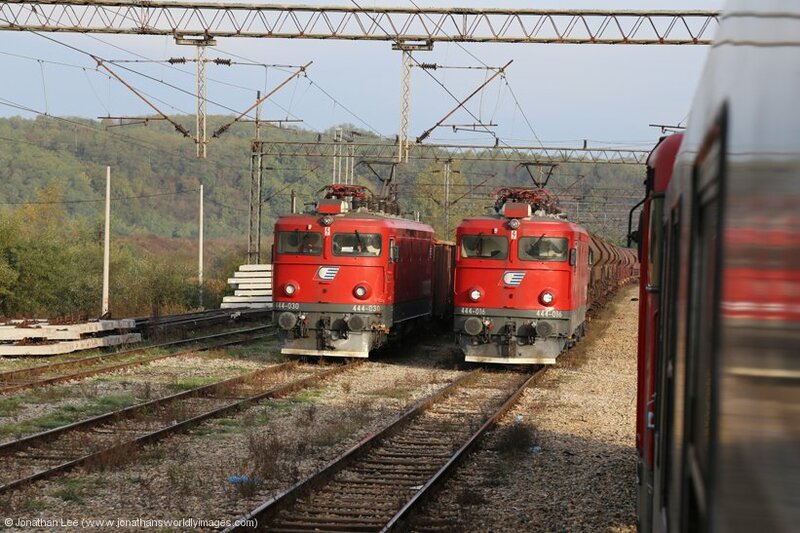 By it, he meant 666001 was about to attach to the train at Kraljevo and work forward to Lapovo over the diesel only diversionary route. ZS 441753 remained attached and was dragged through the section; we didn’t even realise it had been detached with the 666 at Lapovo until we got off at Beograd the following morning. I had a bit of a bellow out of the window at the 666 as it departed Kraljevo, the line speed wasn’t that great but even so it was underwhelming and I was soon back in bed, napping between Nige’s spurts of snoring that woke me every now and again! Thankfully he was a rhythmic snorer and I was able to get more sleep. Surprisingly 12432 1650 (P) Bar – Beograd was only about 20’ late into Beograd. 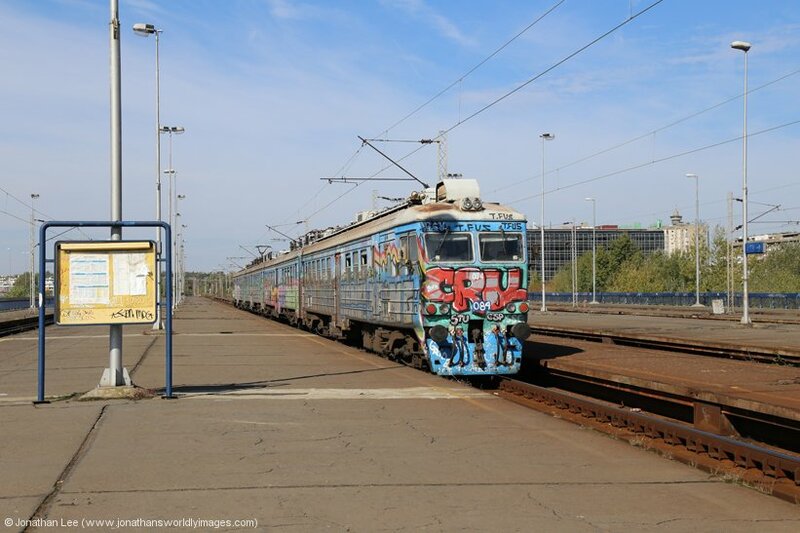 In the station were two rakes of stock, one for 414 1055 Beograd – Schwarzach St Veit and another for 342 1135 Beograd – Budapest Keleti. There were a couple of new EMU’s as well and as we stepped off 12432 we spotted ZS 461011 at the front of the train; which must have replaced both 666001/441753 at Lapovo. On the way into Beograd everywhere had pretty much been a building site with Resnik & Rakovica stations in tatters and partly dug up. Rakovica didn’t even have tracks down the middle platforms, which probably explains why there’s barely a service through there at the moment. 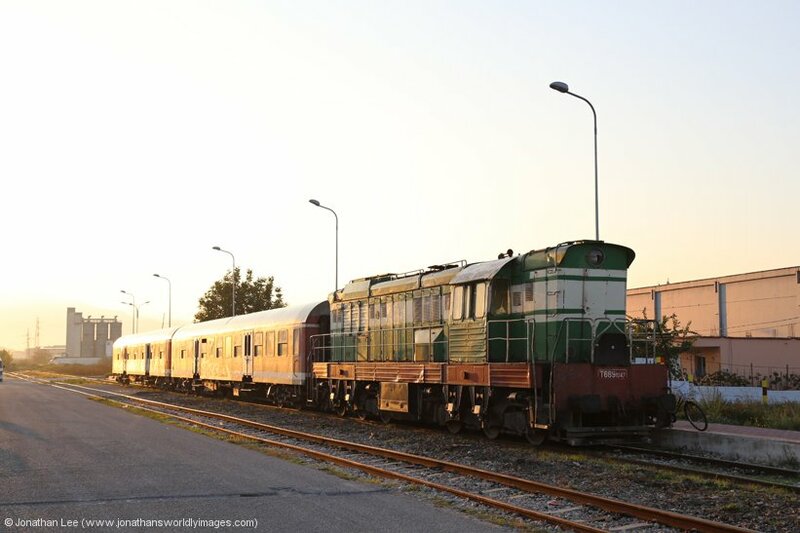 The 3 Tito V200’s were still present in the yard near Rakovica and there was a random 55 lurking about too, 55234. 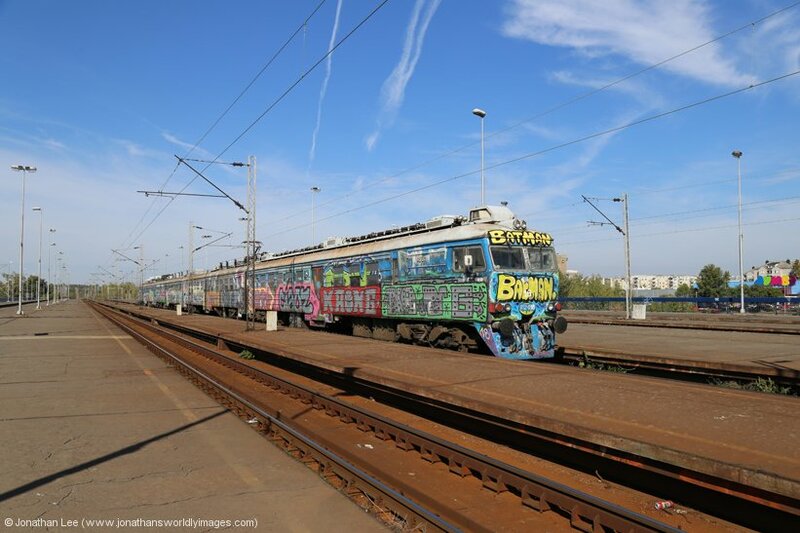 444016, 444030 & 461125 were all sat with freights in the Beograd suburbs too. The station buffet, in the corner on the right-hand side, sufficed for breakfast and omelets were served while we passed the time of day, waiting for an engine to drop onto the load 2 set that would form 414 1055 Beograd – Schwarzach St Veit. 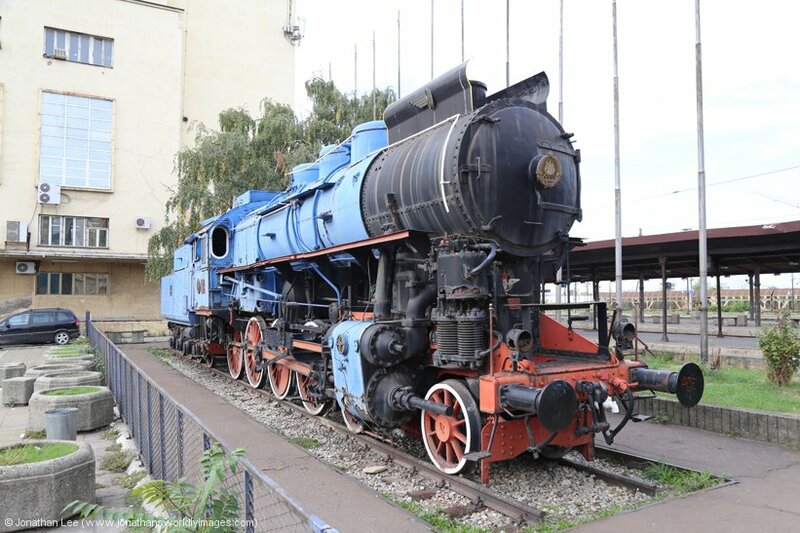 That engine turned out to be 441601 and when we went into the booking office to get a couple of tickets to Novi Beograd we then discovered that 334 1830 (P) Thessaloniki – Beograd was 120’ late on the screens. This turned into 150’ late and the train arrived with 441321/441751; both with pans up and crews in them. At least we were able to photograph it arriving in the morning sunshine. 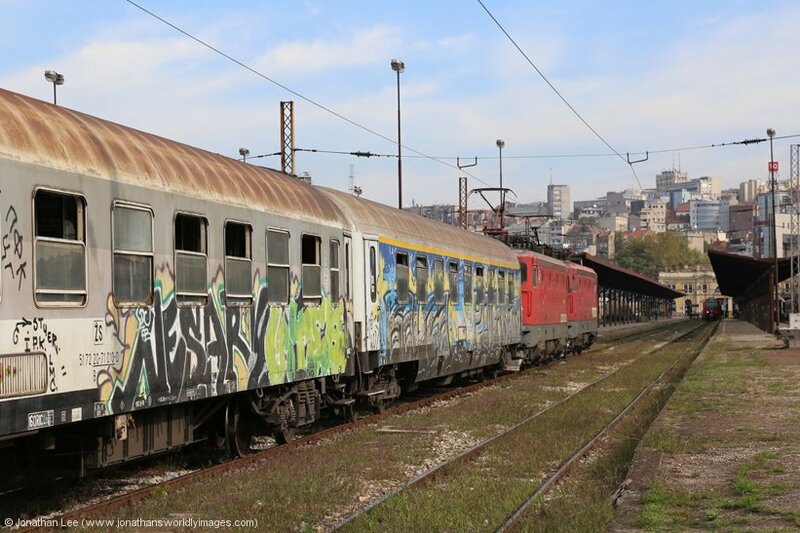 A ticket out to Novi Beograd cost RSD114 and we were gripped onto the train. It wasn’t wedged as it departed but came to an abrupt halt at the platform end. I couldn’t figure out why but as we were close to the main points out of the platform, I assumed the road hadn’t been set correctly for our departure and there were plenty of staff out on the track. 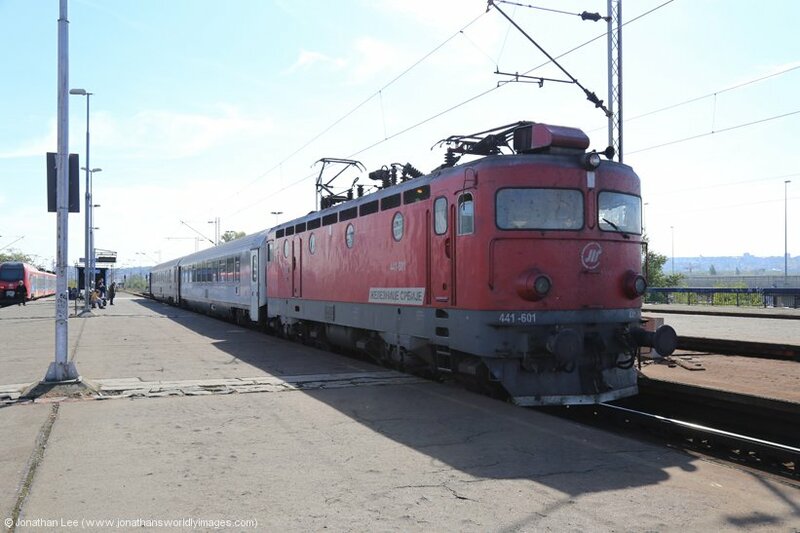 We eventually left 441746 behind, waiting with 342 1135 Beograd – Budapest Keleti and were soon standing on a sunny Novi Beograd station. There was nowhere at all to buy tickets for trains, even underneath the station and confusion eventually had us effing it on a local EMU to Beograd Centar. This as it had arrived in the same slot as the EMU we’d been expecting to do back to Beograd Glanvi. 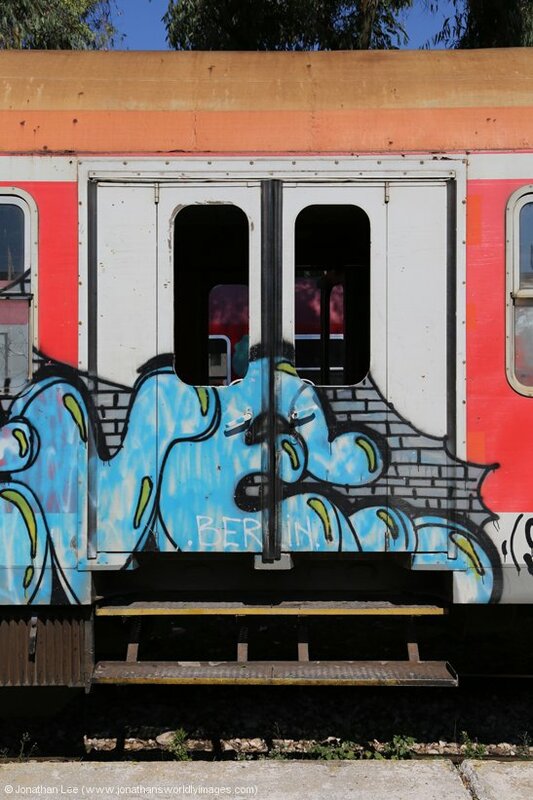 It was nice to see that the Graffiti livery of the local S-bahn EMU’s was still the same as it had been on my last visit; and they all looked to not have been touched since then either, so the graffiti looked to be a deterrent to anyone else giving them a spray! Beograd Centar is a large 10 platform station beneath a car park that has yet to be finished. The platforms have brand new electronic display screens, which had the correct train gen on them. There are no other public transport connects outside the station entrance though, not even a taxi knocking about, so we walked back to Beograd Glavni, which is pretty much downhill all the way. It only took about 15 minutes in the end. With there being no other hauled moves to do we took a walk up to the Belgrade Fortress, which offers good views of the city and is worth a walk up to. I was surprised at how nice the central pedestrian area was, with bustling cafes, restaurants and bars and plenty of people knocking around. After a wander around the Fortress, which doesn’t have entry fees, we walked back down the hill to Zeleni Venac, which is the centre of the universe as far as Belgrade’s buses go. We’d gleaned some info from the worldwide tinternet that bus No.72 would take us from there to the airport and eventually found the correct bus stop for the No.72, or so we thought. When a No.72 did turn up we blagged our way onto it when the driver confirms it was going to the airport and did wonder why it left with only us on it. 100 yards down the road he pulled up to another bus stop with No.72 on it and it was wedged by the time we set back off; so one of the stops if for setting down and the other for picking up so be wary. The far was RSD150 each and the journey took 45 minutes. It’s not an express bus and runs via all the suburbs it can on the way to the airport so don’t be in a rush. Belgrade airport was a simple enough affair and we were sat having lunch 15 minutes after arriving there. Our 1715 Wizz Air departure to Luton was 30’ late departing and on arrival at Luton we found the queue for immigration queuing back out of the main hall and up the stairs out of it! This unfortunately took about 15 minutes to negotiate and we missed the 1955 bus to Luton Airport Parkway by a couple of minutes as a result, which was the last bus that would make the 2007 Thameslink into London, which was the last train I could do to make the 2100 out of Kings Cross. So I flagged the next Thameslink stopper and rode into London on the next fast one with Nige, who was heading to Gatwick. The irony being that the 2100 was still on the departure boards when I got to Kings Cross but by the time I’d legged it to platform 4 I was just in time to watch it start moving away; it was 14’ late and had I done the Thameslink stopped from Luton I’d have made it. The 2135 & 2200 ex Kings Cross were both HST sets and as I was booked on the 2200 I tried my luck on the 2135, even though it was only 17 minutes ahead of the 2200 by Doncaster. Thankfully I was allowed on but only after I explained to the guard that I had an assessment with VTEC in York at 1000 the following morning and needed to get home as early as possible. Can I just say that the VTEC HST sets are amongst the worst riding train sets that remain on the UK network, they really are appalling! At least it got me to Doncaster on time though and when I got into the taxi to take me home, it only seemed like I’d been getting out of one moments before, to head out to Albania. It had been a short trip but it had been enjoyable nonetheless. Thanks to the PTG tour going down the pan I’d changed my plans to come home early, they day before I got a phone call inviting me to an assessment with VTEC the day after I got back from the trip; and it was a job I got offered 3 days after the assessment. Everything happens for a reason, or does it….? Either way my days of controlling Sleepers were limited and I’d be joining the Priv family for the first time in my life very soon, just as the 91’s would be in their twilight years with VTEC!